Homan Walsh loves to fly his kite. 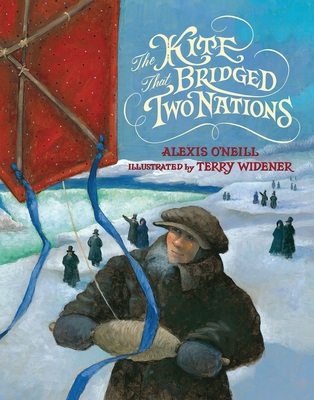 And when a contest is announced to see whose kite string can span Niagara Falls, Homan is set on winning, despite the cold and the wind—and even when his kite is lost and broken. Homan's determination is beautifully captured in this soaring, poetic picture book that features Terry Widener's stunning acrylic paintings. Both author and illustrator worked with experts on both sides of the falls to accurately present Homan Walsh's story. The book also includes an extensive author's note, timeline, bibliography, and further resources. Alexis O’Neill’s love of New York history began when she taught elementary school in Oneida and grew when she served as an education consultant for several museums in Syracuse. The author of award-winning picture books, including The Recess Queen and Loud Emily, Alexis holds a PhD in teacher education from Syracuse University and is an instructor for the UCLA Extension Writers’ Program. She lives in southern California with her husband and can be reached at alexisoneill.com. Terry Widener is the award-winning illustrator of more than thirty children’s books, including Lou Gehrig: The Luckiest Man, a Boston Globe-Horn Book Award Honor Book, The Babe and I, a California Young Reader Gold Medal Award, and America’s Champion Swimmer: Gertrude Ederle, a School Library Journal Best Book of the Year and ALA Notable Children’s Book. He lives with his wife in Texas. Visit terrywidenerart.com.